In August 1993 a team of divers, photographers and historians converged on Palau with one goal, of little apparent significance to anyone but the Palauan government and us (at least when we arrived). However, during our stay, controversy suddenly flared around this goal, which involved recently defeated President George Herbert Walker Bush. Our crew was an experienced bunch, perhaps with the exception of me. It included diver/historian Dan Bailey, who had documented and published on shipwrecks in Palau, Truk and Kwajalein; Dave Buller, a professional diver and magnetometry expert; Pam and Chip Lambert, who own a dive shop and have dived all over the world; and my wife, Susan, a dive instructor with deep water experience. Although I was a relatively recently certified scuba diver (Chip and Pam certified me), I had a lifelong interest in World War II history. As a physician, I figured I was qualified for bandaging coral scrapes. Our goal was to locate and photo-document the Japanese trawler that Ensign Bush sank on 25 July 1944. Apparently, attempts at finding it in the past had been unsuccessful, despite a U. S. Navy after-action report and even a photograph showing the trawler being sunk (such photographs are one of the great side benefits of studying the history of that time). With the fiftieth anniversary of the American invasion of Peleliu one year away, the Palauan government was interested in working with us to find and document this wreck site - to help generate interest in their planned celebration the following year. The controversy arose when it was announced in the U.S. that an article was scheduled to come out in the next issue of Harper's magazine claiming George Bush may be a war criminal because he may have strafed "defenseless combatants in life boats" after sinking the very same trawler we were at that moment looking for! Why this subject came up at that particular moment I have no idea, but we were contacted about the article by Bob Stinnett, author of "George Bush, His World War II Years," with whom we had worked closely before leaving for Palau. The question abruptly became not only "where is the ship?" but also "was it armed?" We found the ship, actually with little problem - but that had as much to do with map reading as it did scuba diving. It turned out that the after-action report of that incident named the wrong island. The ship had been sunk, not off Kayangel, but off nearby and almost identical Ngurangel. Once we had the right place, the one photo suddenly made sense because the landmarks had not changed. Within a couple of hours we had a strong magnetometry reading and, minutes later, we were in the water. The wreck was lying in a channel in a stiff current at 40 feet and clearly had been blown apart. Forty-nine years of stag coral were encroaching on the site, but enough of the deck remained to be searched. 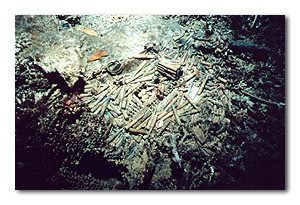 Immediately, we saw thousands of unspent rounds of small arms munitions lying on the stern side. A large gun mount lay on its side and I recognized a munitions box nearby which turned out to have 75mm anti-aircraft shells ready for action. We very rapidly solved two mysteries: the ship's location and that, in fact, it had been armed. So much linked small caliber munitions on the deck suggest strongly that lightweight Nambu-type machine guns had been present and could have even been readily carried into lifeboats. In short, this wreck was not an unarmed Japanese trawler and George Bush had never been a war criminal. The Palauan government was very pleased to have this discovered. The Speaker of the Palauan House of Representatives, Mr. Surangel Whipps, put on scuba gear and dived with us on the site; we also met with Palauan President Kuniwo Nakamura. He asked us to assist in drafting a press release, which the Government of Palau sent out over the wire. "Night Line", about to interview the author of the Harper's magazine article, heard about our discovery and requested video footage to be shown during the show. The rest is history. The "war criminal" story turned out to be a tempest in a teakettle. 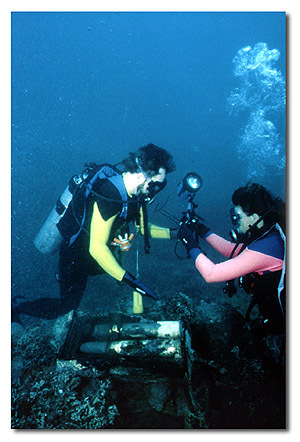 My wife, Susan, and I remained in Palau after the rest of the team left and we could not help but wonder what other wrecks still remained. Taking advantage of our momentary local celebrity status, Susan found a guide who knew of several interesting sites. One turned out to be a 65 foot wing, with one engine still present and an identification plate with "...eneral Electric" still visible. A few miles to the north, he showed us a propeller embedded by itself in a coral head. That such war debris could be sitting undisturbed for fifty years, with no one having any idea of or caring about these wrecks' origins, immediately overwhelmed my senses of curiosity and history. This began my quest. 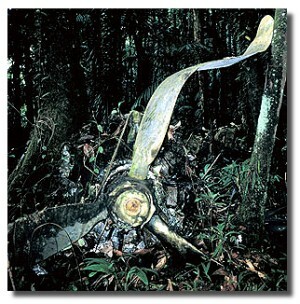 Aside from the fine book, "Shipwrecks of Palau," written by my friend, Dan Bailey, little had actually been written about the Palauan air campaigns, particularly concerning aircraft lost. It was clear that I needed to go to primary archival sources. Researching records at the Air Force Historical Research Center at Maxwell Air Force Base, the National Archives, the Marine Historical Research Center and the Navy Historical Research Center, I began to realize that many American aircraft had been shot down over Palau, some in locations that could be searched for with either scuba gear or machete. I have also tracked down and interviewed many Marine and Army Air Corps veterans of these air campaigns, who added much more information. 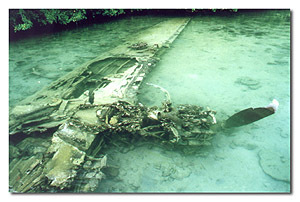 Finally, I have made several more trips back to Palau, speaking with elder Palauans and hiring guides to take me to even more wreck sites. The process continues to this day. Thus far, I have solved the riddle of the wing (which belonged to a B-24) but not the propeller (but I may be close). I have additionally documented wreck sites for another B-24 and two Marine Corsairs, and I am working on finding several more that I have found from archival or from first hand recollections of veterans.